It may seem self-evident, but there’s no way to do patient-oriented research without patients. If you’re not focused on patient outcomes, in a way that directly addresses patient concerns, as identified by patients, then you’re simply engaging in business as usual. The best way to orient your research around patients is by including them in the work. This means engaging patients not simply as data or subjects, but as fully-fledged partners. 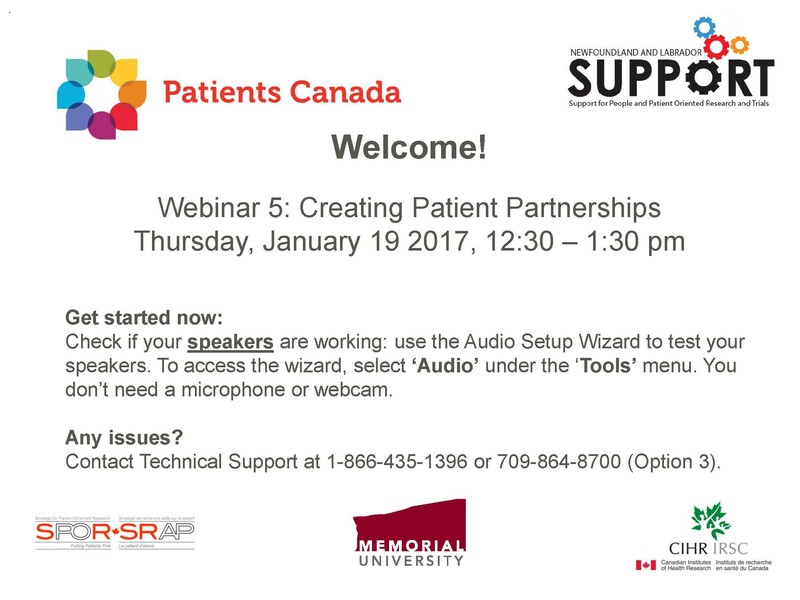 In the fifth of our ongoing series of Patient-Oriented Research Webinars, we are joined by Alies Maybee, a Patient Advisor, SPOR Lead for Patients Canada and blogger. Alies’ presentation focuses on developing partnerships between researchers and citizens in the creation of patient-oriented research teams. The slides from Alies’ presentation are available from the NL SUPPORT website, along with the rest of the webinars in the series; you can watch this and all the other recordings on our YouTube channel. If you’re interested in attending any future training sessions, they’re free to attend and you can sign up in just a few clicks.